I hope everyone had a happy Thanksgiving! I ate my fair share of turkey and treats and am ready for Christmas to begin. To kick off the Christmas season, my son and I made a gingerbread house. He ate about half the candy (practically all of the gum drops) and had frosting all over his hands and face. Of course, I didn’t eat a thing, not one bite, not even a gumdrop…. Disclaimer: this was not made from scratch. 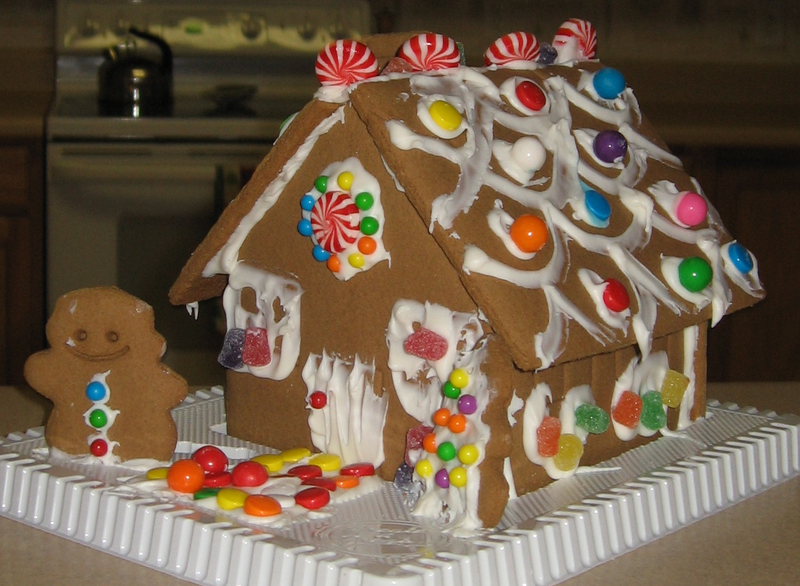 I’ve tried doing that in the past, but always end up with a big mess of frosting, candy, and gingerbread that looks like a demolished house. This year, I found a kit at Walgreen’s that had pre-made frosting and the house went together beautifully – it actually looks a lot like the picture on the box. Hurrah! Of course, the gingerbread in these kits does not taste very good (the frosting is not so bad…), but since this is for show, who cares?